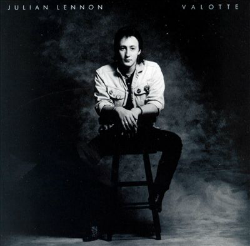 All compositions written by Julian Lennon except “Valotte” written by Julian Lennon, Justin Clayton and Carlton Morales, “O.K. For You” written by Julian Lennon, Justin Clayton, Carlton Morales and Carmello Luggeri and “Jesse” written by China Burton. All songs published by Charisma Music/Chappell Music, ASCAP except “O.K. For You” published by Charisma Music/Chappell Music/Ripples Music Ltd., adm., by Almo Music Corp., ASCAP and “Jesse” published by Virgin Music, ASCAP. Ralph MacDonald appears courtesy of Polygram Records, Inc.
Martin Briley appears courtesy of Polygram Records, Inc.
Special Thanks to Tony Stratton Smith, Steve Weltman, Jon Crawley and everyone at Charisma, Ahmet Ertegun, Doug Morris, Dave Glew, Perry Cooper, Tunc Erim and everyone else at Atlantic. Jimmy Johnson, Rich Calandara and Jay Beckenstein, Emile Charlap, Bob Troler, Eddie and Troy Germano and all our friends in the studios. My mother Cynthia for all she’s had to cope with! Dean for making the whole thing possible! Tony Gordon and Strat for staying the course! Mike Farrell for showing us that life’s not all fun!!!! – Thanks Mike! Martin Lewis for keeping us all laughing! Steve Weltman and Perry Cooper for holding hands across the water! Phil and family for putting up with us and putting us up for so long! Brad Leigh – Let the good times Rock ‘n’ Roll! Karen Kamon and Angela D’Ambrosio for loaning their husbands! And everyone who gave me support throughout the year, especially little Ol’ Debbie!